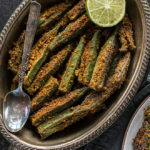 Bharwa Bhindi is a popular Indian side dish where the okra (bhindi) is stuffed with a spicy filling. 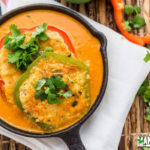 This vegan dish goes really well with flatbread like roti or paratha. 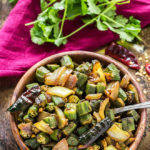 Bhindi aka okra, is one of my favorite vegetables. In India, we cook okra a lot and almost everyone likes it. Sarvesh is a huge fan and so whenever I go to the Indian store here, I make it a point to buy some fresh okra to cook at home. At my home, bhindi was usually cooked in a very simple way with little spices. 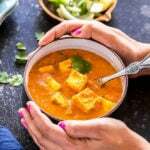 Mom always served that with roti and dal and it made such a comforting and healthy meal. Another way in which bhindi was cooked in my home was by stuffing it with spices aka bharwa bhindi. 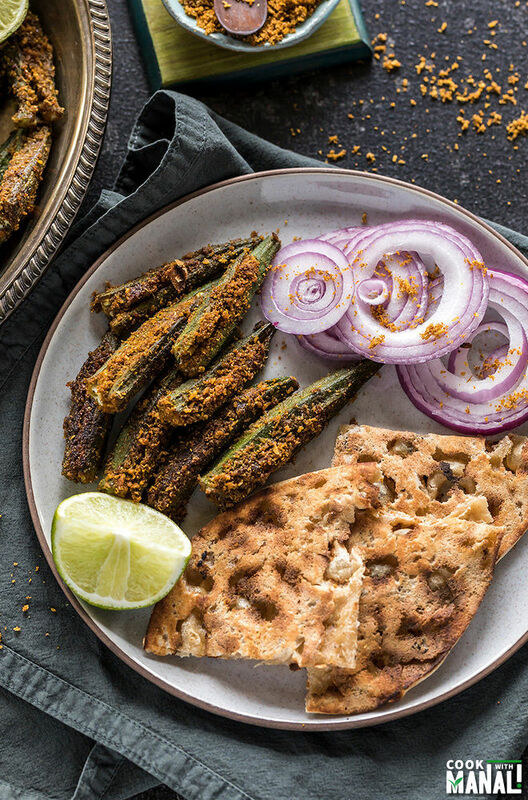 Bharwa=stuffed and Bhindi=okra so in this recipe, the okra is stuffed with a spicy filling and then cooked in a pan. 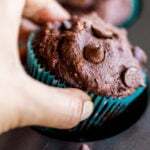 It’s a simple recipe with little to no prep work. The only prep work you have to do is to slit the okra and then stuff them with a spice mix. That’s pretty much it, there’s nothing else to chop or prep. Whenever I make bhindi, I make it a point to let them air dry. This makes cutting the okra really easy, else its a slimy mess. You can do this few hours before you plan to cook it, wash the okra well and then place them on a paper towel and let them dry. I also do this overnight at times, if I can plan that early in advance! (which rarely happens). Okay, so with the stuffed bhindi, obviously it’s all about the stuffing. People use different spices in different proportions. Some people use only few spices, some use besan (chickpea flour) and I used coconut! So my stuffing includes common Indian spices and also coconut. You will notice that I have a lot of spices going on here, well since you don’t add anything else in this recipe, the taste of the okra totally depends on the stuffing so you have to go a little heavy on it. 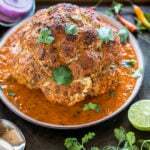 ✓ stuffed with coconut, coriander, cumin and garam masala! While the recipe itself is simple, you have to take care while cooking the okra. First, you have to cook it on low heat. If you cook it on high heat, the okra will get brown quickly but it won’t get cooked. Second, you have to keep turning the okra carefully after every 2 minutes or so. This ensures even cooking. And Thirdly, always place the stuffed okra in a single layer in a large pan. If your pan is small and the okras are all over each other, they won’t get cooked evenly. So its really important to cook them in a single layer in the pan. We enjoyed this bharwa bhindi with some roti and dal. Yes, I served it in the same way mom used to do. Somethings should never change! 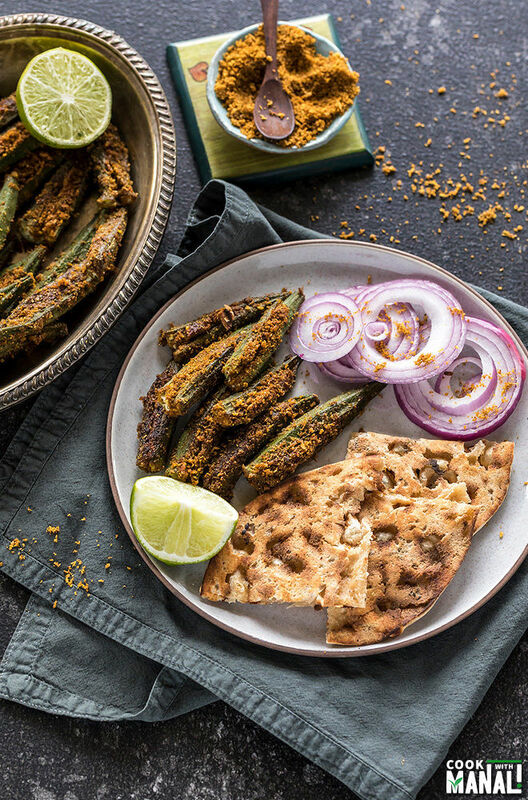 🙂 So next time you have a bag of okra and you are not sure what to do with it, I suggest you try this bharwa bhindi. It will make for a nice change! Looking for more ways to cook okra? Check these out! Wash the bhindi and let it dry. I often use a paper towel to pat dry them. Then make a cut in each bhindi lengthwise without cutting through the entire length. They should still be joint at one end. 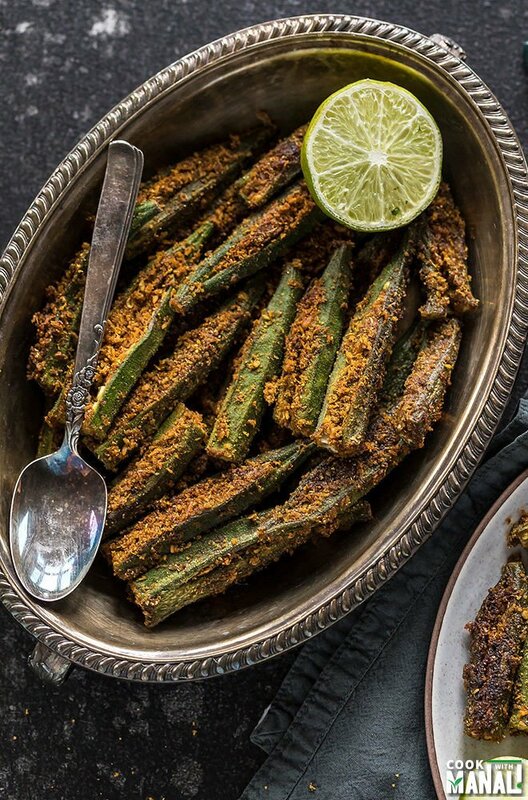 Do this with every bhindi and then set them aside. 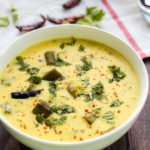 To a large bowl add desiccated coconut powder, coriander powder, cumin powder, dried mango powder (amchur), red chili powder, garam masala, turmeric powder and salt. Mix all the spices together with a spoon. Add 2 teaspoons of oil to the stuffing and mix it well with the spices. The stuffing for the bhindi is now ready. 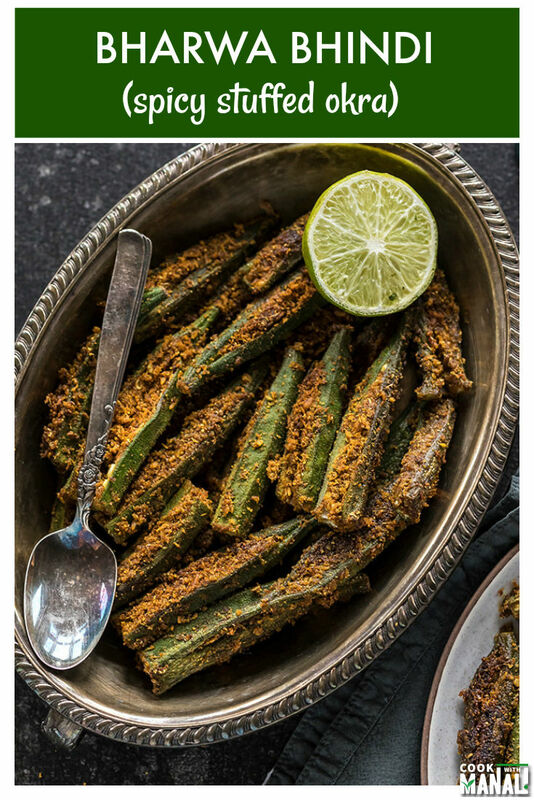 Take one bhindi and stuff it with the prepared masala. Repeat with the remaining bhindis. Make sure to stuff them well with a generous amount of masala. Set them aside. Heat 2 tablespoons of oil in a large pan on medium heat. Place the stuffed bhindi in a single layer in the pan. After 2 minutes, lower the heat to medium-low and cover the pan. After 2 minutes, open the pan and carefully flip each bhindi. Cover the pan again and flip the bhindi again after 2 minutes. Keep tossing the bhindi after every 2-3 minutes or so until it’s tender and done. This will take around 15 minutes on low heat. 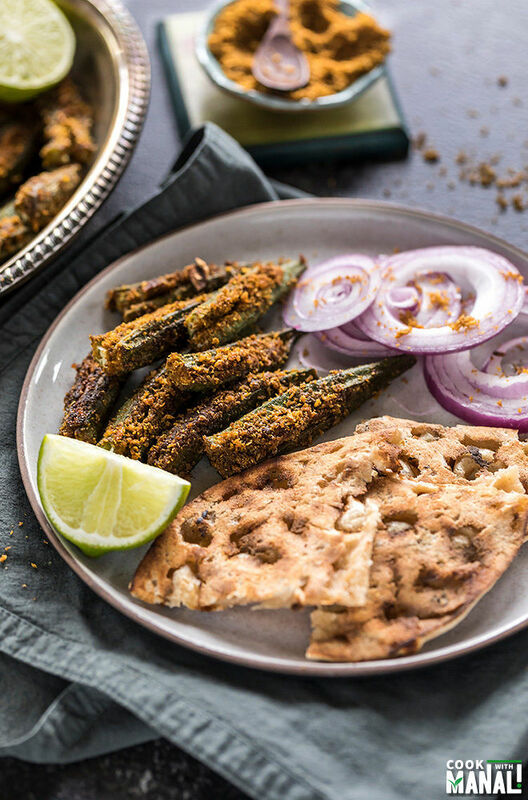 Serve bharwa bhindi hot with roti or paratha. You can squeeze some lemon juice on top before serving for extra tang or also garnish with cilantro. Okra stuffed with a spicy masala. This famous Indian dish goes well with flat-breads like roti and paratha. Vegan & gluten-free. Mix all the spices together with a spoon. Then add 2 teaspoons of oil to the stuffing and mix it well with the spices. The stuffing for the bhindi is now ready. 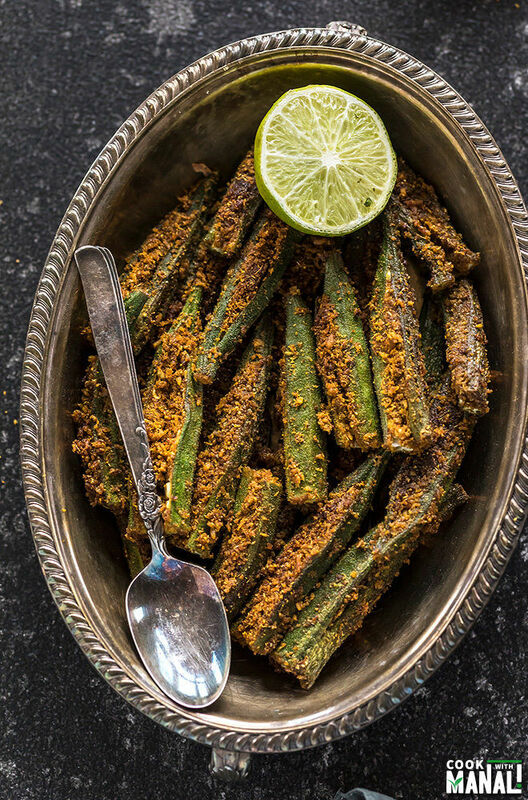 Take one bhindi and stuff it with the prepared masala. Repeat with the remaining bhindis. Make sure to stuff them well with a generous amount of masala. Set them aside. Keep tossing the bhindi after every 2-3 minutes or so until it's tender and done. This will take around 15 minutes on low heat. 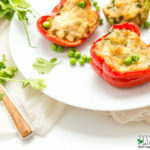 Have never thought of stuffing okra with just masala…they look so inviting! Interesting! I’m quite familiar with okra as it appears in a lot of southern (US) dishes, but I’ve never heard of stuffing it. It’s usually used as an ingredient to help thicken gumbos and stews. But now I want to try it this way! Looks delicious, Manali! I recently moved from PA and am delighted to see so many variations of Okra. I have always known only the Indian way. God bless Cross Border cuisine! That looks soooo good! Can’t wait to make this for weekends. Thanks for sharing! We don’t have okra here, but will search for alternatives … any ideas? Bhindi is my favourite and that too spicy. Thanks for sharing this article. Okra is good for diabetics !!! Even though I didn’t have amchur or turmeric, this was very tasty. My dad doesn’t like okra but he loved this! I will definitely make it again with the full ingredients list. 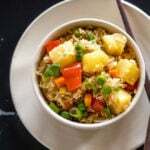 The only vegetable my son loves eating and he simply loved this recipe and so did everyone else in my family….thank you for sharing.